Constables are like tonsils: you don’t really need them and you’re usually better off without them, but if you keep them around, sooner or later they’re going to make you sick. Constables are the anachronistic remnants of another day and time. Like the county weigher and inspector of hides and animals, they have become the vestigial organs of county government. But unlike either of those offices, which no longer appear on our ballot, Lubbock County constables wield all of the power of a Texas peace officer with virtually no accountability. We give them license to take life, liberty or property with the power and protection of the state and yet they report to no one. It’s a prescription for disaster. And now our constables are seeking more power. The question we ought to be asking ourselves is, do we need constables at all? There may once have been a reason to have maverick law enforcement accountable to no one, but whatever it was, the need disappeared a hundred years ago. 21st century law enforcement is a complex and delicate undertaking. Accountability is critical. Credible agencies have identified best practices as well as rules of procedure covering every conceivable scenario. Yet in an age when we have learned government power must be carefully restrained, constables remain free of the safeguards, reporting requirements and oversight to which most law enforcement willingly subjects itself. They have become more a menace to public safety than its guardians. 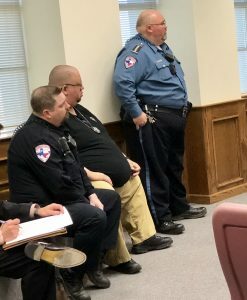 Lubbock County’s constables are the dregs of Texas law enforcement. No fitness standards. No best practices. No accountability. They have become more a menace to public safety than its guardians. One has a difficult time imagining any Lubbock County constable in the uniform of the Lubbock Police or Sheriff departments. In the past 20 years in Lubbock, it’s safe to say there were more criminal charges filed per capita against constables than the citizens they presume to police. The problem is the absence of accountability. Constables Barnes, Peterson and Hannah. Probably the most caricatured of the locals is Constable Precinct 1 Paul Hannah, who sports four command stars on his epaulets; a hollow symbol since Hannah commands only himself. Modesty prevents Constable Hannah from wearing five stars but make no mistake, like all constables, he knows he is answerable to no one. By comparison, Sheriff Kelly Rowe wears three stars and Lubbock Police Chief Greg Stevens displays two today. Of greater concern is Constable Precinct 2 Jody Barnes, who defeated Constable Joe “Crash” Pinson in the 2016 Republican Primary. Like the sitcom character Barney Fife, Barnes can’t wait to use his bullet. He wasn’t in office a full year before he arrived, uninvited, to a Lubbock Police Department scene where he was involved in a shots fired incident (he missed). One wonders if Barnes filed an officer involved shooting report and with whom? Barney Fife’s need to feel important by involvement in a gun battle may be great 1960s era humor, but it is a frightening and deadly proposition today. Barnes, who had a difficult time hacking it as a Lubbock County Sheriff’s Deputy, recently confided to friends he has evidence handling and storage issues related to a Slaton drug arrest. My own experience with Barnes predates his time as constable when he was a clerk at a gun store; the standout memory is the time I was forced to tell the owner if I ever heard that vile racist word used again from one of his clerks I’d not be back. That’s your constable for Precinct 2. The problem is absence of accountability. If Constable C.J. Peterson’s second DWI arrest and insistence on remaining in office wasn’t enough, he has also started a security business. Constables regularly claim to be on duty 24/7, hence their penchant for showing up unasked at other department’s stops or incidents. But when an elected law enforcement official charges citizens extra for what he claims is his job 24/7, it begins to smell more like extortion than security. Where does the constable stop and paid security start? And what powers are they selling? At a minimum, the optics are bad. We might be more kindly disposed to the local constabulary if they followed the law and were satisfied to just do their job as bailiffs for their respective justice courts. But in the impending county budget, Lubbock County Constables are requesting deputies and license plate readers. You read correctly, these four unsupervised and unaccountable to anyone wanna-be cops also want to stop and jail every citizen driving down the road with unpaid parking tickets. And they want help doing it. Do we need constables at all? Larger budgets, additional pretext to stop citizens and requests for deputies, all add up to the constables attempting to expand their power. If they’re that busy, why are they still running radar and making traffic stops? County Commissioners only smile and roll their eyes when asked about the subject. We speculate there will be no deputies in these constables’ future. Please, commissioners, just say no! The U.S. Constitution demands we be very cautious who we give power to take life, liberty or property. This is fundamental to the preservation of our freedom. The present system, with its absence of accountability, is a threat to liberty. Lubbock’s experience with constables is not unique in Texas. A quick Google search will find cries to abolish the office from around the state. The cure for what ails constables is a liberal application of accountability and limited government. Amending the state constitution is the best and only hope for reform. We need our legislators to offer a constitutional amendment making constables accountable to a higher administrative authority or abolishing the office altogether. At least give us the option to vote on the matter county by county. Their constitutional duties can be transferred to the county sheriff. There are, no doubt, many fine constables across the state who will find jobs with the county sheriff if we amend the state constitution. The cure for what ails constables is the liberal application of accountability and limited government. L. Scott Mann is the Sandstorm Scholar and Associate Editor of Lubbock Lights. Mann is a fifth-generation Lubbockite, sixth-generation Texan and independent media consultant. He enjoys family & friends, fine food and firearms...usually in that order. Contact him at LScottMann@gmail.com.